Successfuly planting carrots requires a very finely-worked, moist seedbed. Carrot seeds are very tiny, and in order for them to germinate and be able to push through the surface, the soil it must be kept moist the whole time they’re germinating. See the Growing Carrots article for information on soil preparation. Carrots don’t like to be transplanted, so rather than starting them indoors, it’s best to wait until about 3 weeks before your last spring frost date and then direct seed them in the garden. You can sow carrots in batches at weekly or twice-monthly intervals for ongoing harvests throughout the summer. Plant your last batch about 70-80 days (or whatever days-to-maturity your variety is) before your first fall frost. Planting carrots differs depending on whether your vegetable garden is laid out in rows or beds. Rows: make a very shallow furrow by gently pressing the side of a yardstick into the soil, just enough to tell where you’ve marked. Carefully sow about 2 seeds per inch down the row. You can also mix carrot seeds in with some fine sand in a container, and then sprinkle the mix carefully along the length of the furrow. “Diluting” the seeds with the sand makes it easier to sprinkle them more evenly. Now cover the seeded furrow with about ¼” of fine compost. 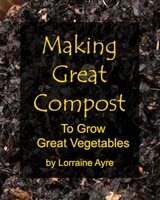 You can use homemade compost that has been crumbled through a coarse screen, or buy a bag of compost from the nursery. Compost is much lighter than soil, retains moisture better, and has substances in it that actually stimulate germination, which all help little carrot seeds to sprout and grow. And the added compost will fertilize the seedlings after they’ve sprouted, too! After your carrots are up, thin them down to about 1 every 3”. If they get crowded, the main taproot will fork. Raised or Flat Beds: I’m a big fan of vegetable gardening in double-dug raised beds. Rather than scattering seeds down a row, I use “hexagonal spacing”, which allows for more plants per square foot and which creates a “living mulch” over the soil, retaining moisture. 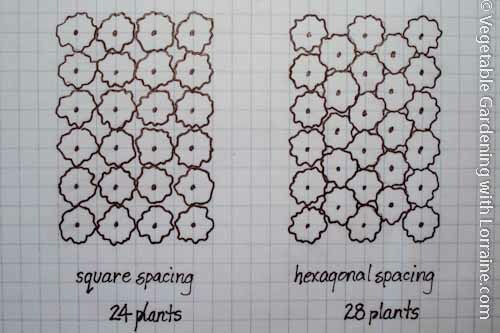 After double-digging and incorporating a lot of compost, I create very shallow depressions every 3” in a hexagonal spacing pattern all across the area I want to plant. This does take time, but I find it works better than trying to thin evenly after broadcasting seed. I put two carrot seeds (an extra in case of poor germination) in each depression, and then cover them with ¼” of compost as above. If both seeds germinate, I snip one off at the base of the stem. This prevents damaging the root of the surviving one. Carrots can take anywhere from 10 days to 3 weeks to germinate, and you have to keep them from drying out the entire time. The colder the soil, the longer they take to germinate. A soil temperature above 55˚F. speeds germination, but a soil temperature below 55 has the advantage of being too cold for nematodes to attack the roots. A great technique for planting carrots that makes maximum use of space is to plant them with radishes. This is especially helpful if you are gardening in rows. The radishes grow super fast, “marking” the row where you have also planted carrots. By the time the carrots are coming up and need space, it’s time to harvest the radishes. Harvest the radishes carefully to avoid damaging the carrots, which will then appreciate the loose soil and extra room. Fill in the radish holes a little from around the edges. Carrots must be harvested correctly in order to store well. Learn when to harvest, and how to harvest them without damage. It doesn't help to grow a great crop of carrots if you lose them all through improper storage. Learn how to prep carrots for long-term storage, and several different ways to keep your carrots edible for several months (or years!). The most common carrot diseases and pests, and how to prevent them in the organic vegetable garden.